Summertime in Wisconsin is when my grill really gets a workout. I am almost embarrassed to say my first gas tank on my grill lasted two years before fizzling out--with burgers on the grill! Maybe I just got lucky and got a super filled one? I really do grill a lot, but when it's just two people (or sometimes one) you don't need a ton of gas. And I have a Kwik Trip really close for exchanges, so those burgers never went to waste--the new tank was on before they could even cool down. July 4th is a grilling day across this great nation and I partake every year. Obviously July 4th has a much bigger meaning than that, but if grilling out in our backyards definitely says freedom to me. Thank you to all our service folks--past, present, and future-- for this day of celebration. There is always a get-together somewhere and if I'm not "manning" the grill myself, I'm bringing something delicious to grill at someone else's event. 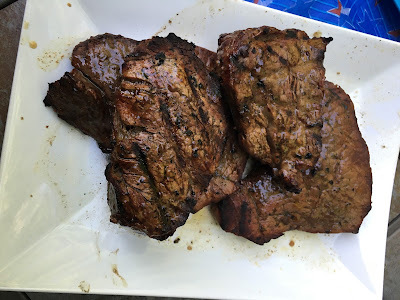 The Wisconsin Whisk group sent out an invite in June to do a BBQ blog hop and I was assigned grilled meat. 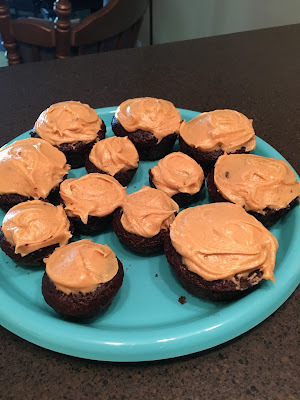 So many recipes went through my head. This year, we are fortunate to have two family's providing their grills to us on the holiday weekend. We are spending the 3rd with my guys family in the Appleton area. The adults are all getting steaks and the kiddos get hot dogs (they don't appreciate good meat yet!). On the 4th, we are spending time with my parents and not sure what will be grilled yet, but it will be something awesome. Last weekend I had my folks over for an impromptu grill out. We marinated some steaks and thawed some 'dogs for the girls. Though steaks don't always need a marinade, when you don't spend top dollar, you can sometimes enhance a steak's flavor with a few key seasonings. 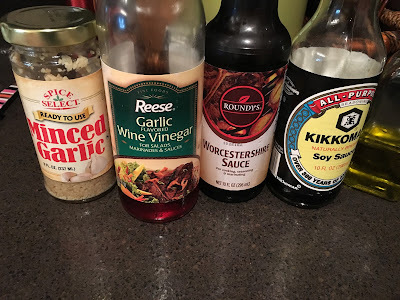 I have become a huge fan of vinegar and read a few years ago that it helps break down meat proteins to make them less tough. 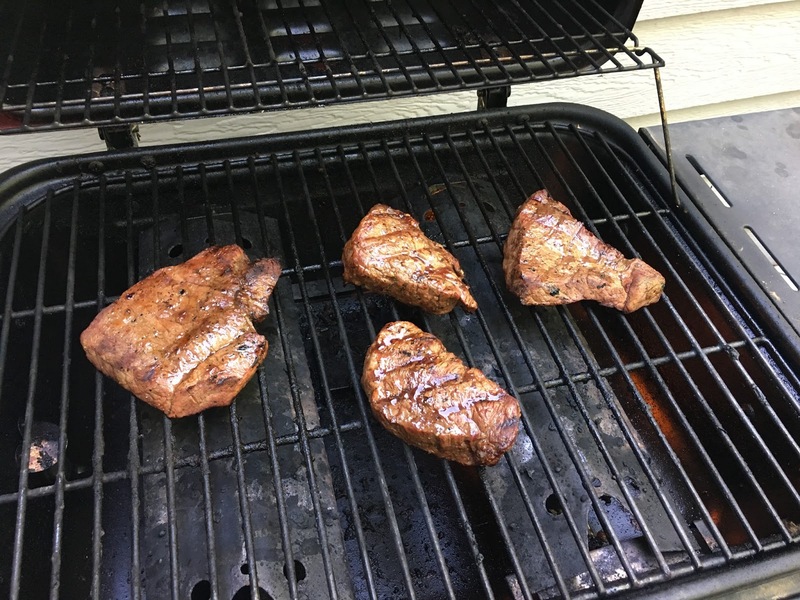 I don't want to take away from the grilled meat flavor too much so I keep my marinades simple and only on for a short length of time. For our steaks, I made a simple marinade from Red Wine Vinegar infused with garlic, minced garlic, Worcestershire sauce, soy sauce, EVOO, salt, and pepper. 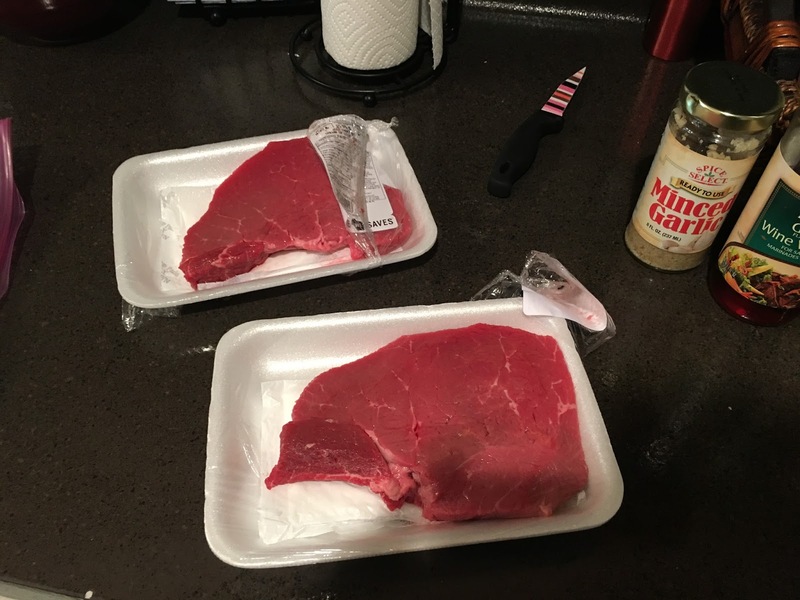 See below for measurements for two small steaks. I only let the steaks marinate for two hours and then brought them back to room temp before grilling so they would cook evenly. I am still mastering steaks on my gas grill as it has warm and hot spots. I am very cautious with overcooking, so I use a meat thermometer to check internal temp. And I always remember that food continues to cook even after removed from the heat. LET IT REST! 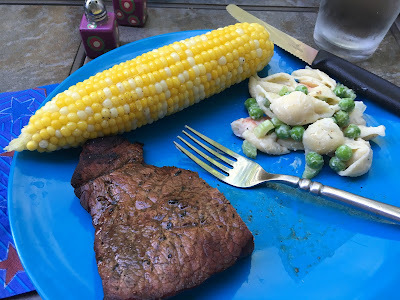 My parents brought over some thick petite fillets and though they only marinaded for a half hour, my parents still tasted the added flavor and were impressed. It added just enough extra to the meat without taking away from the quality that we bought. On the side we had boiled corn on the cob, shrimp pasta salad, fresh watermelon, and peanut butter frosted chocolate cupcakes for dessert. This was a meal that scream cookout to my fiance and I. We were so happy with the turnout of everything. And yes in Wisconsin, watermelon and corn cobs are ready for the season, so eat up! Happy Independence Day Everyone! Put all in a Ziploc bag with the steaks (we selected think filets, but it worked well with fat cuts too - about 1 lb meat total). 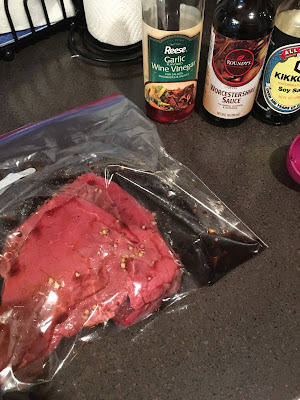 Seal and turn end over end to get the marinade all over the steaks. Place in fridge and flip bag after 1 hour. Marinate 2 hours max. Grill to your liking and enjoy with your favorite side dish recipes. 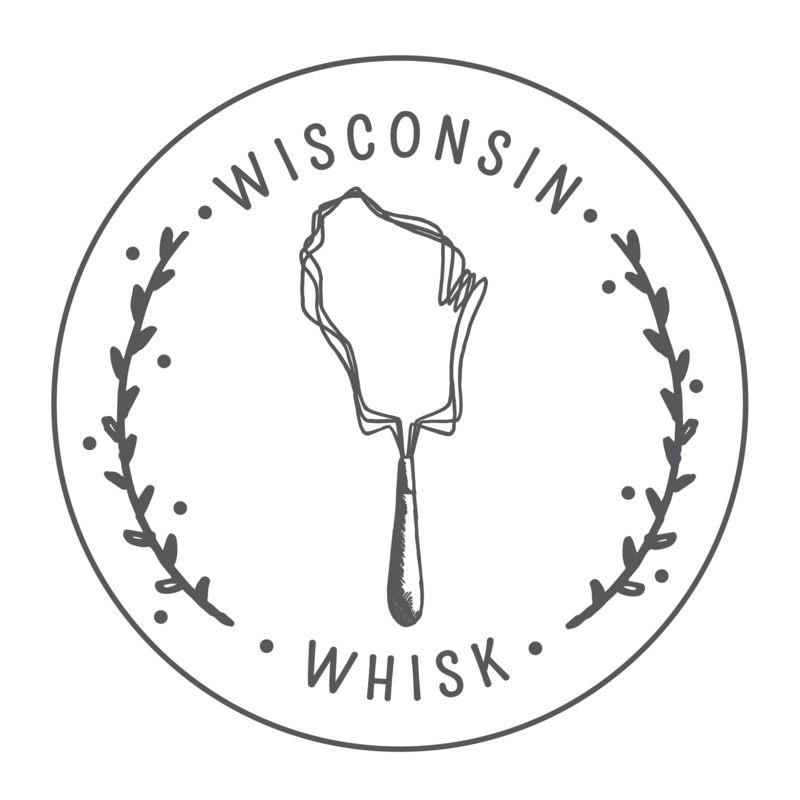 See all the other participating Wisconsin Whisk bloggers' recipes at the link below. Steak, corn and pasta salad. I'd say that's a perfect summer cookout! It really was a great cookout! Thanks for reading!